Ashgabat (Aşgabat) is the capital and largest city of Turkmenistan, a country in Central Asia, and is situated between the Kara Kum desert and the Kopet Dag mountain range, about 19 miles (30 kilometers) from the Iranian frontier. The city is not far from the ancient capital of the Parthian Empire. Some of the earliest traces of agriculture in Central Asia from the Neolithic Jeitun civilization (fifth millennium B.C.E.) were discovered some 20 miles north of the city. Ashgabat, a city of around 900,000, is primarily a government and administrative center and is a major stop on the Trans-Caspian railway. Since the country's independence, the city has undergone significant building development, and has a number of magnificent government buildings, mosques, and museums, as well as new housing construction. The city's spectacular environment has made it a popular center for filmmaking. However, widespread internal poverty, a poor educational system, government misuse of oil and gas revenues, and Ashgabat's unwillingness to adopt market-oriented reforms are viewed as obstacles to prosperity. The name "Ashgabat" is believed to derive either from the Persian Ashk-ābād meaning "the City of Arsaces," or a loose translation of the Persian عشق (eshq meaning "love") and آباد (ābād meaning "cultivated place" or "city"), "the city of love." Before 1991, the city was usually spelled "Ashkhabad" in English, a transliteration of the Russian form. Ashgabat is about 15.5 miles (25km) to the north of the Kopet-Dag mountain range, and the city's northern boundary touches the Karakum Desert. Because of this location, Ashgabat has an arid climate with hot and dry summers and mild and short winters. Summer temperatures can easily sit on 104°F (40°C). June through August are hot, with night temperatures normally not falling lower than 86°F (30°C). Winter starts in December; snow is rare and there can be abundant rain. Normally, winter temperatures are 50-60°F (10-15°C), and rarely can go as low as -10°C (14°F) in January. The lowest temperature was recorded in January 1969, -18°F (-28°C). The desert city suffered a chronic water shortage until the construction on Karakum Canal, the largest irrigation and water supply canal in the world, from the Amu-Darya River across the Karakum Desert, reached the city in 1962. Since independence, Ashgabat has undergone significant building development, and has a number of magnificent government buildings, mosques, and museums, as well as new housing construction. First Bahá'í House of Worship. Ashgabat is a relatively young city, growing out of a village of the same name established in 1818. It is not far from the site of Nisa, the ancient capital of the Parthians and the ruins of the Silk Road city of Konjikala, which had been destroyed either by an earthquake in the first decade B.C.E., or by the Mongols in the thirteenth century C.E. Ashgabat remained a part of Persia until 1884. In 1869, Russian soldiers built a fortress on a hill near the village, and this added security soon attracted merchants and craftsmen to the area. Tsarist Russia annexed the region, in 1884, from Persia under the terms of Akhal Treaty, and chose to develop the town as a regional center of the Transcaspian oblast (province) due to its proximity to the border of British-influenced Persia, and its position on the caravan routes and on the Transcaspian Railway. It was regarded as a pleasant town with European style buildings, shops, and hotels. 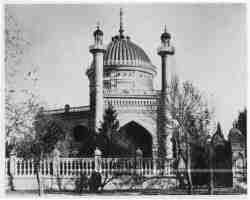 In 1908, the first Bahá'í House of Worship was built in Ashgabat. The city had a population of more than 45,000 by 1911. Soviet rule was established, lost, and then regained in 1917, and the city was renamed Poltoratsk after a local revolutionary. The name "Ashgabat" was restored in 1927, when the Communist Party was properly established in Turkmenistan, though it was usually known by the Russian form Ashkhabad. From this period onward the city experienced rapid growth and industrialization. A magnitude 7.3 earthquake on October 5, 1948, caused extreme damage in Ashgabat and nearby villages. Up to 110,000 died in the event, in which almost all brick buildings collapsed, concrete structures were heavily damaged, and freight trains were derailed. The official death toll announced by Soviet news at the time was only 14,000. The Bahá'í House of Worship was seriously damaged in the earthquake in 1948, and was demolished by the Soviet authorities in 1963. 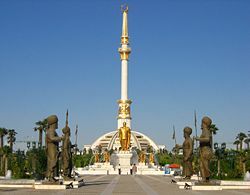 After independence in 1991, the Turkmenistan government adopted the Turkmen version of the city’s name, Ashgabat. 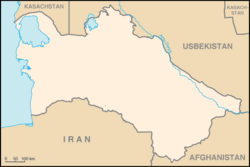 Turkmenistan is a moderate Islamic state in a volatile region. The politics of Turkmenistan take place in the framework of a presidential republic, with the president both head of state and head of government. Turkmenistan has a single-party system. Any opposition to the government is considered treason and punishable by life imprisonment. The country has many political prisoners. Turkmenistan is dominated by a pervasive cult of personality extolling the late president as “Türkmenbaşy” ("Leader of all Turkmen"), a title Saparmurat Niyazov assumed in 1993. 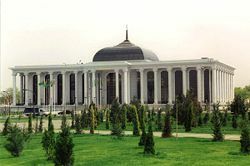 Türkmenbaşy Palace, the presidential headquarters and home of the president of Turkmenistan is located in the city of Ashgabat. The country is divided into five oblasts, or regions, with a lower tier of local government, including a mayor, a deputy, and a council, appointed by the president. Since independence, the material situation has improved markedly, with a marked increase in the number of consumer goods available in stores. However, this improvement appears to have been orchestrated for political purposes, because at the same time the political situation has deteriorated, especially in terms of human rights. Turkmenistan is largely a desert country with nomadic cattle raising, intensive agriculture in irrigated oases, and huge natural gas and petroleum resources. One-half of its irrigated land is planted in cotton, placing the country in the top 10 to 15 producers. It possesses the world's fifth largest reserves of natural gas and substantial oil resources. Widespread internal poverty, a poor educational system, government misuse of oil and gas revenues, and Ashgabat's unwillingness to adopt market-oriented reforms are viewed as obstacles to prosperity. Ashgabat is primarily a government and administrative center. The principal industries are cotton textiles, carpet-weaving, glassworks, and metal working. It is a major stop on the Trans-Caspian railway. The city's spectacular environment has made it a center for filmmaking. 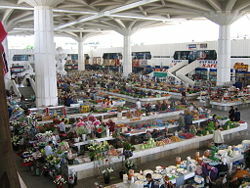 The city is served by Ashgabat Airport, the only international airport in Turkmenistan. It is located approximately six miles (10km) northwest of the city. The airport, with its air traffic control tower and a 12,000 foot-long precision-approach runway (12L-30R), opened in 1994 and was named after the country's first president, Saparmyrat Niyazov (1940-2006). Ashgabat had a population of 695,300 in 2001. Ashgabat has a primarily Turkmen population, with minorities of ethnic Russians, Armenians, and Azeris. The Türkmen language, a member of the East Oghuz branch of Turkic, is spoken by 72 percent of the population, 12 percent speak Russian, nine percent speak Uzbek language, while languages spoken by the remainder are not specified but includes the Balochi language. Türkmenistan remained secular after independence, although a cultural revival has occurred since then with the return of moderate Islam. Ashgabat has a primarily Sunni Muslim population, with 89 percent as Sunni Muslims of the Hanafi school, Eastern Orthodox make up nine percent, and the religious affiliation of the remaining two percent is unknown. Education was in the Islamic tradition before the state-funded Soviet system, which remained after independence. There are kindergartens and elementary schools, and graduation at eighth grade is mandatory. Tertiary educational institutions include the Turkmen A.M. Gorkii State University, as well as polytechnic, agricultural, and medical institutes. The Academy of Sciences of Turkmenistan is an important institute of higher learning, which has a unique Institute of Deserts. The Ashgabat International School is a private, non-profit day school for students of all nationalities. The Ashgabat National Museum of History contains over 500,000 exhibits particularly archaeological and ethnographical finds throughout the country including rare works of ancient art, paintings, drawings, sculptures, carpets, rugs, fabrics and clothing; household utensils, musical instruments, weapons, jewelry, medals, historical documents, horn-shaped vessels made of ivory, statuettes of Parthian goddesses, and colorful Buddhist vases. It also contains a significant number of fossils and rare geological finds. Other museums include the Turkmen Fine Arts Museum, noted for its impressive collection of woven carpets, and a Turkmen history museum. Large mosques include the Azadi Mosque (which resembles the Blue Mosque in Istanbul), the Khezrety Omar Mosque, and the futuristic Iranian Mosque. Ashgabat is also home to the Arch of Neutrality, which is a large tripod featuring ornate inscriptions and a glass elevator. On top there is a golden statue of former President Saparmurat Niyazov (also known and generally referred to as Turkmenbashi, or leader of the Turkmens). This statue rotates in order to always face the sun during daylight hours. It is said to be made of pure gold. Ashgabat has an opera house and theaters, including the Theater Ashgabat, also known as the Pushkin Drama Theatre. Encyclopaedia Britannica Online. Ashgabat. Retrieved July 13, 2008. Kropf, John W. 2006. Unknown Sands: Journeys Around the World's Most Isolated Country. Houston: Dusty Spark Pub. ISBN 9780976356516. Radio Free Europe. Turkmenistan 10 years later. Retrieved July 12, 2008. Turkmenbashy, Saparmyrat. 2005. Rukhnama: Reflections on the Spiritual Values of the Turkmen. Ashgabat: State Pub. Service Turkmenistan. This page was last modified on 19 April 2016, at 15:13.